Celliant Sleep Enhancing Sheets work by converting body heat into Infrared Energy. Celliant® recycles human energy in the form of heat. The heat your body emits, powers the minerals in the Celliant® fiber, the minerals then convert that heat into infrared light. The infrared light penetrates into the muscle and tissue to promote localized blood flow. Celliant fiber is the result of extensive development by leading experts in medicine and science. This proprietary fiber is loaded with a potent mix of thermo-reactive minerals. Powered by our own metabolism, it is more of a hybrid engine than a textile. It recycles and converts radiant body heat into something that gives the body an infrared energy boost. Celliant delivers the benefits of infrared technology to nearly every application where the textile is used, including apparel, bedding, healthcare and veterinary products. Celliant® tetchnology will last the lifetime of the material and will never wash out or breakdown. 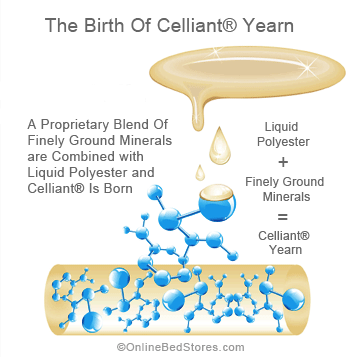 Celliant products are considered medical devices because they are intended to affect the structure or function of the body of man by temporarily promoting increased local blood flow at the site of application in healthy individuals. The FDA has determined that Celliant products are medical devices as defined in section 201(h) of the Federal Food, Drug and Cosmetic Act and are general wellness products. 400 Thread Count, 54% Cotton and 46% Celliant® Sizes: Queen, King, Cal King, Split King, Split Cal King.